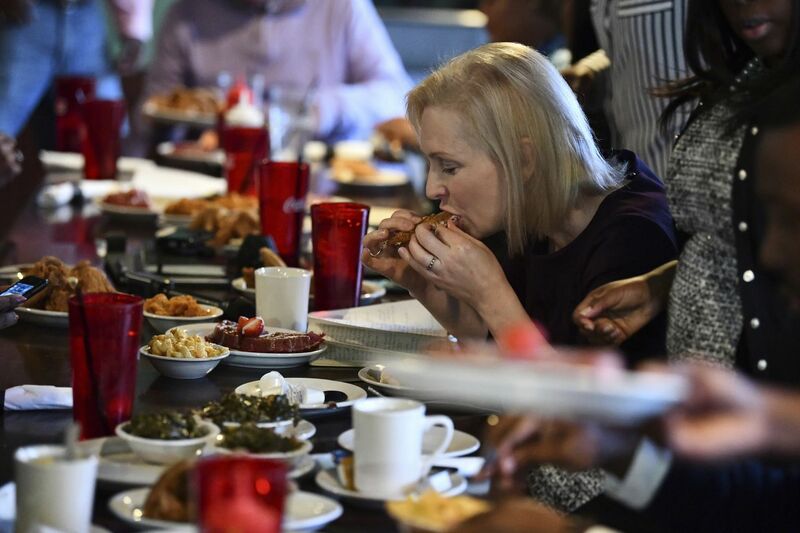 In this Saturday, Feb. 9, 2019, photo Sen. Kirsten Gillibrand eats at Kiki’s Chicken and Waffles in Columbia, S.C. Gillibrand spent three days in the state as part of her effort to introduce her potential presidential campaign to the state’s heavily African-American Democratic primary electorate. Poor Sen. Kirsten Gillibrand. The Democratic New York senator, now a 2020 White House hopeful, entered the race practically glowing with the current zeitgeist of today’s Democratic Party, the angry women who marched in the millions after President Trump was inaugurated in 2017 and converted that energy into a Democratic House majority last November. But Gillibrand has struggled to gain traction in the ever-growing, just-list-who-isn’t-running field of Democratic candidates. Some of that might be rooted in concern over how the upstate New Yorker morphed from a pro-gun centrist into an avatar of the Trump Resistance, and that’s a valid question. But that’s not exactly how the journalists following the 2020 race framed any doubts over Gillibrand’s viability over the weekend. Instead, they presented voters with #FriedChickenGate. The political trope about the candidate awkwardly gobbling down ethnic food is as old as pastrami itself, probably dating back to the penny press ripping John Adams for the way he gnawed on a fried possum. OK, I made that up, but I’m not making up how reporters parlayed any serious coverage of how a President Gillibrand might get us out of the giant mess that’s been created at 1600 Pennsylvania Avenue into an analysis of what happened when she met African-American leaders at a joint called Kiki’s Chicken and Waffles in the critical early-primary state of South Carolina. The fact that Gillibrand started eating her chicken with a knife and fork, but then switched to her fingers after noting that all her companions were using their hands, wasn’t portrayed as the natural awkwardness that every sentient human being has felt at some social gathering where messy could-be finger food like greasy chicken or slathered barbecued ribs is on the table. No, the moment was a Grand Metaphor for a candidate who was “contrived,” who changed her stance on the Fried Chicken Question just like she’d changed her position on amnesty for undocumented immigrants. My fellow journalists, are we really going to do this again? By “this” I mean the shallow political journalism that hung over the 2016 presidential election like the misty fog of an unseasonably warm and gray winter day, that created a vacuum that was filled first by actual “fake news” back when that term actually meant something and finally by the orange gloaming that currently corrupts the Oval Office. The kind of journalism that gave unlimited TV coverage to one candidate’s “entertaining” Nuremberg-style rallies or even his plane just sitting in a tarmac while news executives screamed about the ratings just like the orgasmic Faye Dunaway in that scene in “Network.” And the kind of journalism that equated what should have been a minor one-week mini-scandal over an email server with what should have been the story of the millennium, the American Experiment giving way to neo-fascism. After the shock of President Trump’s November 8, 2016, victory, many leaders in the news business promised a major examination of what went wrong — but from Day One there seemed to be confusion over what was actually meant by “wrong.” The publisher of the New York Times, which sits atop the American news pyramid, issued a much-discussed quasi-apology that seemed largely a mea culpa for ignoring Trump voters (thus, 774*-and-counting reports from tobacco-spit-stained diners in southern Ohio); remarkably the Paper of Record has never apologized for a) the day shortly before the election when it treated an ultimately inconsequential thing about those damned emails like the Second Coming of Watergate or b) the story also right before the election that falsely claimed the FBI had uncovered no Trump-Russia ties (when it actually had). Generally, there were vague promises — in line with the media’s post-Trump “Democracy Dies in Darkness” pronouncements — that campaign coverage would be more serious and less hijack-able by trivia once the 2020 race got underway. But that moment has now arrived, and it looks like the same people are covering this presidential election — with the same tired bag of tricks. The most egregious case, in my opinion, has been the coverage of Sen. Elizabeth Warren of Massachusetts, who wasn’t just the first Democrat to announce for 2020 but so far has been the boldest when it comes to both diagnosing how American got into this jam and prescribing actual solutions. Warren has charged head-on into the loaded-yet-critical issue of income inequality with proposals like a wealth tax on multi-millionaires and billionaires and legislation that would force big corporations to be held accountable. But is she, you know, “likable”? That was the bizarre question that hung over the first days of the Warren campaign (inspired, presumably, by the notion that 2016 voters rejected a qualified woman because they didn’t like her and you can’t change the voters not matter how misogynistic they are, so you should kowtow to them by changing your candidate) only to be supplanted by the endless controversy over her apparently minor-level DNA of Native American heritage. It lingers even after the Boston Globe showed this wasn’t something she benefited from. And a very minor incremental development — one more document from a time where we already know she was writing “Native American” on documents — gave political journalists the green light they apparently wanted to make sure “the Indian thing” overshadowed her official announcement. The Washington Post even headlined its story, “Warren set to announce candidacy amid lingering questions about her identity,” as if she were some amnesiac wandering around outside Fenway Park. I guess the conversation about Warren’s wealth tax and accountability for big corporations will have to wait until someone stands up in a courtroom and identifies her. Meanwhile, as noted above, Klobuchar’s iconoclastic in-a-blizzard presidential announcement was overshadowed — by the choices of political headline writers, at least — by several reports that journalists raced to file that chronicled the Minnesota senator’s alleged mistreatment bordering on abuse of her staff. That, in my opinion, is a legitimate issue, because it does seem to offer some (negative) insights into her leadership style — yet it’s impossible not to wonder if an alleged Boss From Hell who happens to be male would be covered in the same way. The Times (which I just excoriated) had a decent piece this week tackling this problem, and it’s a real one. But modern political journalism has been really shallow when just men were involved (just substitute John Kerry’s Philly “Swiss cheesesteak” for Gillibrand’s fried chicken), and I think a lot of the problem is that after not knowing how to cover a norm-busting president like Trump, the Democratic primary race is familiar turf that allows journalists to fall back on familiar tropes, no matter how tired. There’s still nearly a year before the Iowa caucuses — plenty of time for political scribes and their newsroom bosses to change their ways, and there’s no shortage of good ideas. Jay Rosen, the New York University professor and media critic, has argued the answer isn’t exactly “more issues coverage,” which has become such an eat-your-broccoli chore that it’s usually done poorly. Instead, Rosen has called for newsrooms to canvass their communities to develop “a citizens’ agenda” of what voters actually want to know about the candidates — and then deploy their resources accordingly. That’s a great idea. It’s a lot easier to focus on what we know journalists shouldn’t be doing — “horse race” reporting and polls, turning one-day stories into one-year scandals, and of course “the chicken thing” — than what we should be doing. But I think it’s critical to remember that good coverage is more than just “where do the candidates stand on climate change” (which is still important, though) but also telling readers what would this woman or man be like as president. Because we need to do better than Tweety McTweetface. I’ll offer a quick example: A recent piece by Paul Waldman in the Washington Post that proved you can write about Warren and Klobuchar in a meaningful way, without the distractions that led most of the weekend coverage. Instead, Waldman drilled deep into their fundamental visions of America that were different in important ways — with Warren seeing the American Experiment as deeply off course and in need of radical repair, while the more centrist Klobuchar suggesting the only real problem is broken politics. By the end of the piece, I had some new insights and thoughts about their candidacies, and what I want to hear over these fraught 21 months that lie ahead. We should demand that kind of vision and a lack of fluff from every article that’s written about the 2020 presidential race — and send back the fried chicken. * Not the real number — it just feels that way.